The first thing this passage reveals could easily be missed. 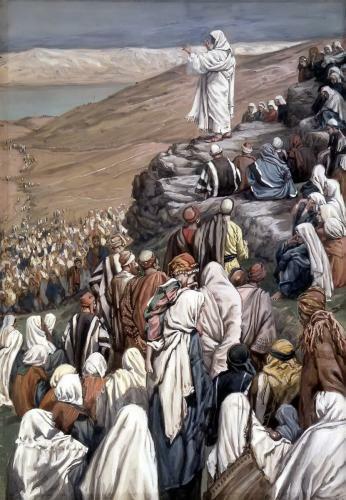 It reveals Jesus’ deep concern for the crowds of people. He not only cared for their souls, He also cared for their bodies in that He did not want them to go away hungry. This reveals Jesus’ total care for His followers. We know the rest of the story. Jesus multiplies the loaves and fish and feeds the multitude. And though this is an incredible miracle on a physical level, it is just as miraculous on a personal and spiritual level. Personally speaking, the miracle is that God, the Almighty, the Omnipotent One is deeply concerned about the small detail of feeding the crowd their next meal. This reveals that God is not only concerned for our eternal salvation, He is also concerned about our daily needs. Note that the passage quotes Jesus as saying, “My heart is moved with pity for the crowd…” And “I do not want to send them away hungry…” This very personal and human concern of Jesus should offer us great comfort in knowing that His care is deep and exhaustive. The concern Jesus has for the physical need of food for His followers also points to His spiritual concern for His followers’ souls. If He cares this much about the body, He cares all the more for the soul and deeply desires to nourish their souls with the food of eternal life. Reflect, today, upon Jesus’ deep and all-consuming care for you. Know that there is no detail of your life that escapes His notice. Though that may be hard to believe at times, know that it is absolutely true! Surrender all to Him in trust and know that He is there to reach out to you in your every need. Lord, thank You for Your unfailing and perfect concern for every detail of my life. Thank You for Your perfect attentiveness to my needs. May I always trust in Your perfect care for me and surrender to Your loving providence. Jesus, I trust in You.